KCCA will be missing in action this weekend as they have a continental fixture with CNaPS on Friday. The Azam Uganda Premier league will resume this Saturday with only KCCA and Bright Stars not in action. The game between KCCA and Fred Kajjoba’s side has been postponed due to the ‘Kasairo Boys’ involvement in the CAF Champions league. KCCA takes on CNaPS Sports of Madagascar on Friday and so will not be able to honour their first Second Round league fixture. 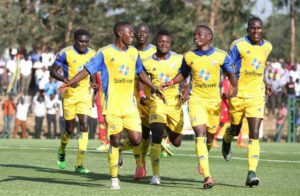 With the return leg of that game slated to be played in seven days, KCCA has also seen their game with leaders SC Villa postponed to the following Tuesday the 23rd in a move aimed at giving the two time league defending champions enough time to rest as they prepare to take on CNaPS. Besides that, Azam UPL leaders SC Villa will kick start their second round at home to Maroons FC. Villa hold a three point lead on KCCA FC who are in second and the 16 time record league champions will have a chance of extending that lead further. Meanwhile, troubled Express FC travel to the green light stadium to face unbeaten Onduparaka in a game of significant value for both sides as the Caterpillars look to re-ignite their tittle aspirations and Express will want to kick start their surge up the table from the relegation zone. It will be a huge ask of the Red Eagle getting all three points as Onduparaka have never lost a league game at the venue since they joined the top flight last season. In other fixtures, giants Vipers will travel to Kavumba to take on Soana, Police host Mbarara City and URA are away to Bul in Kakindu. SC Villa still lead the log with 32 points from 15 games, KCCA are second three points, Vipers and Onduparaka occupy third and fourth respectively. The biggest fixture in Ugandan football will take place on 11-May when Express FC host SC Villa in the Kampala derby at Wankulukuku stadium on game week 29 in one of the games that could potentially decide the title and Express FC’s fate in the league. Vipers SC will host KCCA FC at the St. Mary’s Stadium in Kitende on the 28th of April in another potential tittle decider as both teams are still in contention to win the league this season. UPDF FC are still rooted at the bottom with Express FC giving them company in 15th along with Entebbe based Masavu FC who occupy the last relegation spot.